In conjunction to the 7th architecture biennale, the organizers have arranged a 4 days symposium of lectures and events, including talks and panels discussions by participating architects. 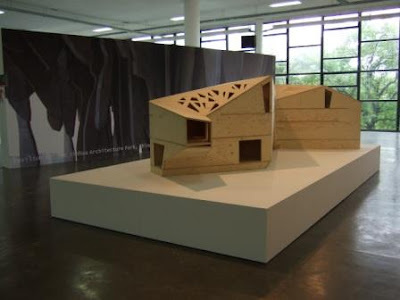 The Danish delegates (curator Henrik Valeur and architects Kolja Nielsen_ CEBRA, Tue Foged and Sinus Lynge_EFFEKT) contribution to this was scheduled for Tuesday. 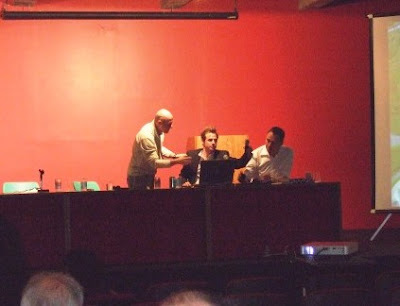 The biennales lecture halls are situated in a basement under the biennale building. There were no visible signs or indications leading the visitors down there, so we were not exactly surprised to arrive and discover that only a handful of people was sitting in the auditorium. However, as all introductions were completed and the 2 hour long lecture was in course, more people gradually trickled into the room. By the start of the following debate the atmosphere was rather intense and the room almost full. The Brazilian architects where quite demanding, asking a lot of intricate and long questions -- not all of them for the cause of getting a reply I believe. However, it turned out to be a rather interesting debate in the end, entertainingly supplemented by the constant giggles of the simulate interpreter talking to the audience through headphones. Tuesday was also the last day at the biennale for most of us visiting from Denmark. 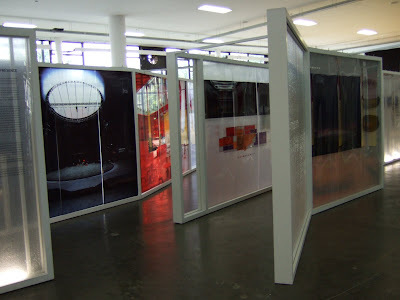 It was actually quite upsetting to have to leave –both Sao Paulo and the beautiful biennale pavilion. I think we are all really hoping to be able to go back for the next biennale, as this has been a thoroughly amazing experience. Arriving at the pavilion Monday morning, we realize that the biennale actually is closed on Mondays, and we take the day off to get a chance to see a little of Sao Paulo’s architecture. On top of one of Sao Paulo’s tallest buildings, Edificio Italia, the view is nothing less than spectacular. Although the building is 46 floors high, it is impossible to see beyond the city limits and Sao Paulo’s impressing skyline. 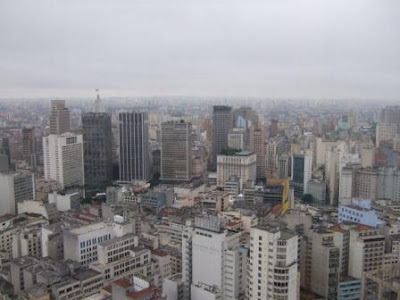 I guess it finally dawns on us all that Sao Paulo really is the second largest city in the world. When I come back to the hotel in the evening, I open my computer to find some exciting news; the curator of CO-EVOLUTION, Henrik Valeur, has been invited to take part in the jury of the “7th BIA General Exhibition of Architects”, which I believe reflects that CO-Evolution is being rather well perceived by the biennale organizers. Arriving at the pavilion Sunday morning, for the first public viewing of the biennale, I am as always struck by the quiet beauty of this building. The morning light filters through the palm trees and the tropical plants growing outside , rendering the room with sharp shadow and an atmosphere of complete serenity. There are no traces left of yesterday’s party; the bustling atmosphere or the masses of people pushing their way through access ramps and galleries have been exchanged for newly polished floors and a continues trickle of solitaire wanderers, actually taking their time to sit down in one of the many reading areas or watch the full course of a 20 minutes video. Most of the different representations are walking around, checking their exhibitions for damage. Surprisingly enough, considering all the fragile models, it seems no one has had anything broken during yesterday’s excitements. Co –Evolution is in perfect condition. With a little help of our security guard we fill up with the remaining 150 catalogues, and leave to finally have a closer look at some of our other favorite contributions. When we arrive back a little less than an hour later, they are all gone. The 10th of November at 14.00 everyone was asked to leave the biennale so that the pavilion could be prepared for the grand opening. Over a short few hours bustling activity, mess and noise was replaced with a horn orchestra, party clothes, newly polished concrete floors and large crowds of people impatiently waiting to get in. But in Brazil, a certain set time is not more set, than that adding another hour or two to an appointment is perceived unproblematic. –Delightfully relaxed and extremely annoying. Sao Paulo is hectic and fascinating. With approximately 12 million citizens (20 millions in the lager metropolitan zone) the city is the largest in the southern hemisphere. It is a compound of cultural and ethnical amalgamations, that fully lives up to its reputation as a tropical New York. In the middle of this New York is Sao Paulo’s central park; Parque do Ibirapuera. With its two square kilometers of recreational space, the park is a vital green lunge in the city’s pulse, used on a daily bases by the Paulistanos (the city’s inhabitants),which often have their lunch breaks in one of the many small cafés, while school classes are walking hand in hand through the parks impressive museums. The Ibirapuera Park was opened in 1954 as celebration of the 400-years anniversary of Sao Paulo. For me, as an architect, being in this park is like stepping into an architectural hit-list; buildings by Oscar Niemeyer and Hélio Uchôa, landscape designs by Burle Marx. One architectural pearl after another are tied together by the Grande Marquise – a gigantic concrete roof construction, which creates amazing outdoor spaces, limited only by the parks tropical plants and the green lawns, where skaters, ice-cream stands, playing children and smiling Paulistanos confirm the Brazilians warm and hospitable reputation. 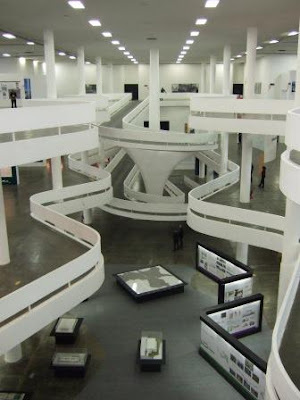 The 7th Sao Paulo biennale of architecture will open tonight, in one of the most remarkable exhibition halls an architect could ever hope to have his works exhibited in; Oscar Niemeyer’s Cicillo Matarazzo Pavilion. It’s an impressive power demonstration, where repetitive and potent concrete constructions, supplemented by details almost marginal in their design, creates spatial precision and astounding facade esthetics. Focus is not on the sophisticated and superficial, but on the modernistic simplicity and almost brutal architecture, that really becomes this exhibition building. If you’re not already left breathless by the beauty of the surrounding park, I’ll guarantee you stepping into this building will make it happen. It is as if the simplistic repetitiveness of the building collects vast amounts of energy, just to release it all at one precise location; the amazing system of ramps and balconies that with typical Niemeyer shapes in black and white, leads the visitors through the buildings 30.000 square meters of exhibition space. And it is within this framework that the Danish contribution to the biennales of Venice and Beijing currently is visiting Sao Paulo. 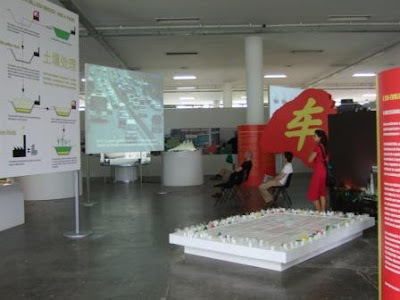 It seems so obvious that Co-Evolution, a project about sustainable urban development in China, developed through intercontinental collaboration between four young Danish architectural offices and four Chinese universities, should visit the second largest city in the world; a city that just as Shanghai and Beijing, severely struggles with our common global and climatic challenges. Co-Evolution is not only relevant in a Chinese setting, as all the projects four parts foremost shows approaches towards sustainable urban development, that can inspire development in China as well as in South America. As I’ve already said, the biennale opens tonight. 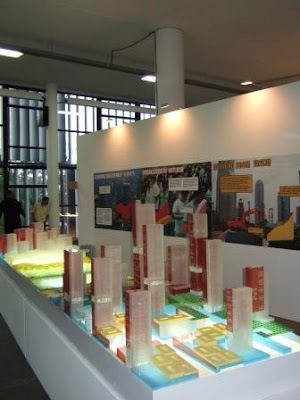 The Danish contribution is in place, and we can use the rest of the day to visit Lina Bo Bardis art museum (MASP) in Avenida Paulista, and to see her conversions of an old steel basin factory (Pompeia) into a sports and culture center (SESC). Tonight I will head on to the biennale and Oscar Niemeyer; not only to the building but also the special exhibition that has been set up under the Grand Marquise. It seems evident to celebrate an architect that has his 100-birthday this December and actually still is active! - That, I’m looking forward to. 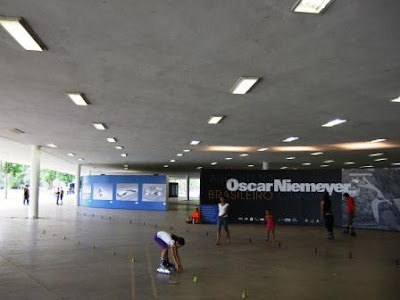 The Sao Paulo biennale has its home in the very famous Oscar Niemeyer pavilion in Sao Paulo’s Ibrapuera Park. This beautiful modernistic building provides over 30.000 square meters of exhibition space, and the biennale usually hosts several hundred projects at a time. The participants are from all over the world, however traditionally the Europeans contribute as national representations while the South-and Latin American countries as well as USA, tends to participate as several individual companies or groups. Among this years more famous participants are architects Steven Holl, Plasma studio, Urban Think Tank, Jakop+ Mac Farlane and Schmidt, Hammer & Lassen. Denmark, and the Co-evolution exhibition, is placed in the area of national representations, on the second floor next to Holland and Norway. Counting down to the opening tomorrow, the pavilion is bussing with frantic activity. 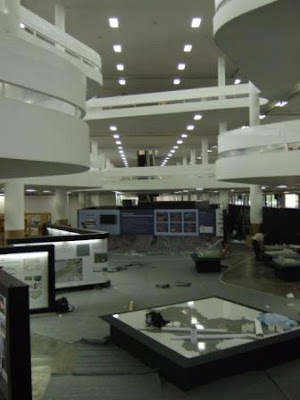 Architects, exhibition designers and huge crews of technicians from allover the world is struggling to get their stands finished in time. The atmosphere on second floor is bordering on hysteria as the biennale organizers not yet have finished with building and painting their set-ups, and several of the European countries still have their exhibitions stuck in customs. In the 500 m2 area designated for the Dutch representation, a solemn looking security guard is doing 24 hours watch over an empty exhibitions space. Out of 11 countries, only Switzerland, France and Denmark are approaching completion. However, although it currently might seem a little unrealistic for all the countries to reach the finish line by tomorrow, I’m actually quite confident that they will. This kind of chaos is not alt all unusual the day before the opening of an architecture biennale. In fact, It is almost always so. But, with an amazing amount of hard work and late night hours, as well as some joint efforts and extra hands from the finished teams, it always works out well in the end. As part of the Co-Evolution world tour, DAC is this year, participating in the International biennale of Architecture in Sao Paulo. The biennale in Sao Paulo is after Venice the second most important biennale in the world, and usually has a visitor’s average of 200.000 people over its six weeks duration. This year’s biennale, which is the 7th in the row, will be on display from the 11th of November until the 16th of December. As this is the first time DAC participates in The Sao Paulo biennale we would like to share our experiences and discoveries at the pavilion with you all. Over the next few days daily updates from Brazil will be available in this blog.